Waist Aprons – These great aprons are perfect for waiters and waitresses who need to carry pens, check slips, and straws around as they wait tables! Bistro Aprons – Bistro aprons are an elegant solution to your staff’s apron needs. We provide durable full and half bistro aprons. Bib Aprons – Whether you need selections with or without pockets, our business provides a huge selection of bib aprons for your crew. Cobbler Aprons – Find unique aprons for your restaurant crew when you pick up classic cobbler aprons from our business. 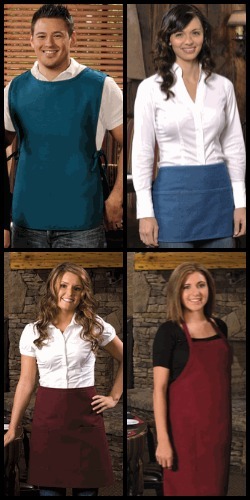 Don’t wait another minute to order aprons from Sharper Uniforms. We have every type of aprons you could want! Additionally, we are proud to say our aprons are made in the USA. Review our waitstaff aprons and place an order with us today!